This experiment evaluated the effects of two fat sources on performance, some blood parameters and carcass characteristics of broiler chicks. One hundred and eighty day-old broiler chicks were randomly assigned to five dietary treatments (three replicates of 12 birds per treatment). The experiment was performed as a completely random design (CRD) and birds were fed isoenergetic and isonitrogenous diets containing no fat (control), 20 and 40 g soyabean oil, 20 and 40 g beef tallow/kg feed from 11 -42 d of age. Food intake and body weight gain both increased significantly with supplemental level of both fat sources, the rate in food intake being higher with soyabean oil than with beef tallow. Feed conversion ratio decreased significantly with both sources in the period 29 " 42 d. Serum triglyceride and very low density lipoprotein (VLDL) contents were unaffected by dietary oil inclusion but cholesterol, high-(HDL) and low (LDL) density lipoprotein contents increased significantly with oil level. Serum glucose (GLU) content decreased significantly with increasing oil inclusion. In all cases the blood parameters responded significantly differently to the two supplemental fat sources with the rate of reduction in GLU, cholesterol and LDL, and the rate of increase in TG, HDL and VLDL being greater with soyabean oil than with beef tallow. Liver and abdominal fat percentages increased significantly with supplemental fat inclusion. 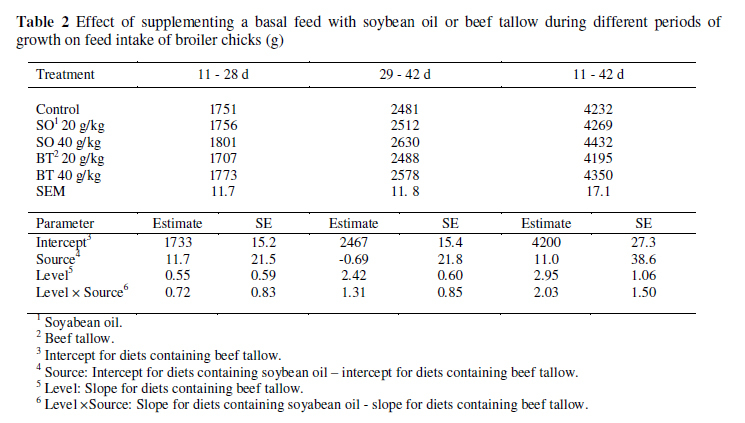 The results indicate that supplementation of broiler diets with up to 40 g soyabean oil/kg feed significantly improved the performance and reduced serum cholesterol, LDL and abdominal fat in comparison with chicks receiving diets containing beef tallow. The term "fat" (animal or vegetable) is used as a synonym for lipid in human food as well as in ingredients for animal nutrition. The addition of fat to diets, besides supplying energy, improves the absorption of fat-soluble vitamins (Baião & Lara, 2005), provides varying quantities of the essential fatty acids, diminishes the dustiness, increases the palatability of the rations and improves the energy efficiency (Nitsan et al., 1997; Balevi & Coşkun, 2000; Palmquist, 2002). Furthermore, it reduces the passage rate of the digesta in the gastrointestinal tract, which allows a better absorption of all diet nutrients (Moav, 1995; Palmquist, 2002). Fats or oils as energy rich feeds are available from animal sources such as tallow and fish oil or from plant sources such as soyabean, sunflower and maize oil. Tallow has traditionally been used in poultry nutrition and its production is noticeable throughout the world and there has been a great use of tallow in blended oil for poultry (Balevi & Coşkun, 2000; Tabeidian et al., 2005). Tallow has included about 42.5% saturated fatty acids (SFA) and only 1% unsaturated fatty acids (UFA) that all of them are n-6 fatty acids (Sadeghi & Tabeidian, 2005). Soyabean oil stimulated growth rate of chicks when supplemented in poultry diets. Unsaturated vegetable fats or oils are more energetic than saturated animal fats (Nitsan et al., 1997). In diets with similar nutritive value, chickens fed with rations containing oil showed better performance than birds fed diets without oil inclusion (Palmquist, 2002). Accumulation of large amounts of fat in abdominal cavity is a problem in modern broiler strains. Abdominal fat is removed by evisceration, thus decreasing processing yield (Sadeghi & Tabeidian, 2005). Vila & Esteve-Garcia (1996) found that sunflower oil produced less abdominal fat deposition in broilers than tallow at different levels of fat inclusion. Diets rich in UFA have been found to reduce fat deposition in broiler chicks when compared to diets supplemented with the same amount of fats rich in SFA (Sanz et al., 1999). All these studies suggest that dietary fatty acid profile could affect abdominal fat deposition. Dietary fat can alter blood composition and serum lipoprotein levels. Generally, SFA increase plasma LDL which are atherogenic, whereas HDL provides protection against atherosis. Dietary polyunsaturated fatty acids (PUFA) decrease serum VLDL, LDL and cholesterol and increase HDL value compared with SFA (Grundy, 1989; Kinsella et al., 1990). There are few experiments designed to study the effect of different levels of supplemental fat in low energy diets on performance and blood parameters of broiler chicks. Therefore the purpose of the present study was to evaluate these effects on performance, some blood parameters and carcass characteristics of broiler chicks. A total of 180 1-day old mixed Ross 308 broiler chicks were randomly allocated to 15 groups of 12 birds each and reared for 42 d. There were five treatments (treatment 1: control diet without supplemental fat; treatment 2: 20 g soyabean oil/kg; treatment 3: 40 g soyabean oil/kg; treatment 4: 20 g beef tallow/kg; treatment 5: 40 g beef tallow/kg) in this experiment. Beef tallow was obtained from a local slaughterhouse. Tallow was heated to a liquid state and then added to the feed before mixing. The values assigned to the metabolizable energy (ME) of tallow and soyabean oil used for diet formulation were 27.2 and 35.1 MJ/kg, respectively. The diets (mash form) were formulated to meet nutrient requirements according to NRC (1994). Feed and water were provided ad libitum and a 23 h photoperiod was used throughout the experimental period. All chicks were fed a commercial starter diet from 1 to 10 d, whereafter they were fed isoenergetic and isonitrogenous grower (12.1 MJ ME/kg, 194 g protein/kg) and finisher diets (12.3 MJ ME/kg, 175 g protein/kg). Ingredients and compositions of experimental diets are presented in Table 1. Body weight gain and feed intake were recorded weekly from which feed conversion ratio was calculated. Mortality was recorded throughout the experiment. Prior to blood sampling, feed was withdrawn for 12 h to decrease the effects of feeding on blood parameters. At the end of the grower and finisher periods two birds from each replicate, with body weight similar to mean replicate body weight, were selected for blood sampling for measurement of serum GLU, TG, cholesterol, HDL, LDL and VLDL. The blood was collected in a test tube to obtain serum. The collected blood samples were centrifuged at 3000 g for 10 min and the serum was decanted into aseptically treated vials and stored at -20 ºC for later analysis. Serum GLU, TG, cholesterol and HDL were measured spectrophotometrically by using commercial kits and enzymatic method. LDL and VLDL levels were estimated using the Friedewald equation (Friedewald et al., 1972). At the end of the experiment (42 d), two chicks (male and female) from each replicate were slaughtered, and after bleeding, fat pad, breast, thigh, liver and heart were weighed and presented as a percentage of carcass weight but with carcass being presented as a percentage of live weight. Treatment means and standard errors of the mean were calculated using analysis of variance (SAS Institute, 2002), and responses were determined using simple linear regression with groups (fat source) using GenStat 5.42 (GenStat Committee, 2000). 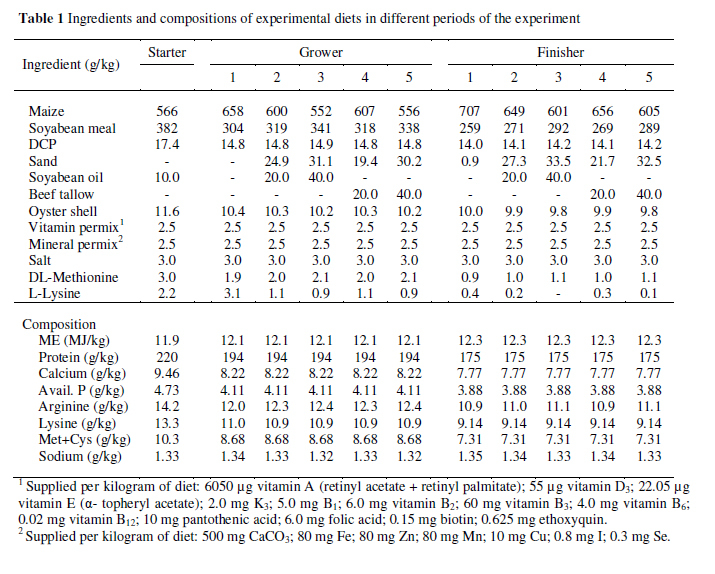 Data in Table 2 show that feed intake was unaffected by dietary oil inclusion in the first period, but in the second period this increased (P <0.01) with increasing oil inclusion, the increase being an additional 2.42 ± 0.60 g for each g increase per g dietary oil in the second period and 2.95 ± 1.06 g over both periods. This response in feed intake was the same with both supplemental fat sources in all phases of the experiment, the interaction terms (level x source) being non-significant (P >0.05) in all cases. Body weight gain of broiler chicks was influenced by dietary oil inclusion in the period 29 -42 d and over both periods (Table 3), increasing (P <0.01) with oil inclusion at a mean rate of 2.84 ± 0.73 and 3.34 ± 0.79 g for each g increase in oil/kg feed respectively. However, the responses differed between fat sources with that for soyabean oil having a higher slope in the second period and overall (2.54 ± 1.03 and 4.12 ± 1.12, respectively, P <0.01) than that for beef tallow. The response in feed conversion ratio did not differ between supplemental fat sources or, in the first period, between levels of inclusion, but in the second period there was a small decrease (-0.003 ± 0.001, P <0.05) in feed conversion ratio as the levels of each fat source were increased. Data in Table 5 show that the TG and VLDL content of broiler chicks were unaffected by dietary oil inclusion in the two periods, but that the cholesterol, HDL and LDL content increased (P <0.05) with oil level, being an additional 0.34 ± 0.04, 0.07 ± 0.03 and 0.30 ± 0.05 mg/dL in the first period, and 0.37 ± 0.03, 0.07 ± 0.03 and 0.33 ± 0.04 mg/dL in the second for each g increase in oil/kg feed. The GLU content decreased (P <0.01) with increasing oil inclusion at a rate of -0.38 ± 0.03 mg/dL at 29 d and -0.41 ± 0.03 mg/dL at 42 d/g additional oil. 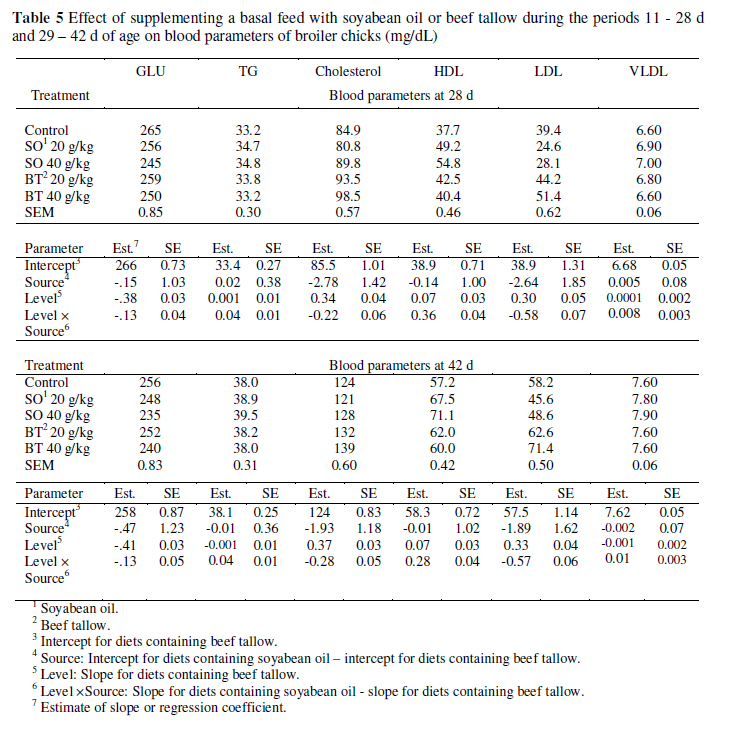 In all cases the blood parameters responded differently (P <0.05) to the two supplemental fat sources with the rate of reduction in GLU, cholesterol and LDL, and the rate of increase in TG, HDL and VLDL being greater with soybean oil than with tallow. Carcass, thigh and heart content at 42 d were unaffected by dietary oil inclusion (Table 6) but breast (-0.1 ± 0.01) and liver (-0.002 ± 0.001) content decreased (P <0.01) with increasing oil inclusion. Abdominal fat content increased (P <0.01) with increasing oil inclusion, the rate of increase being 0.01 ± 0.001% for each g increase in oil / kg feed. The two supplemental fat sources had the same effect on carcass, thigh, breast and heart percentages. The inclusion of oil or fat to a broiler feed has been reported to have many different effects. In this trial feed intake increased as the rates of inclusion of both supplemental fats were increased, being similar to the results of Atteh & Leeson (1984) and Bartov (1987) who observed significant increases in feed intake of chicks when diets were supplemented with fat (tallow) in comparison with a control group (no fat). Similarly, Tabiedian et al. 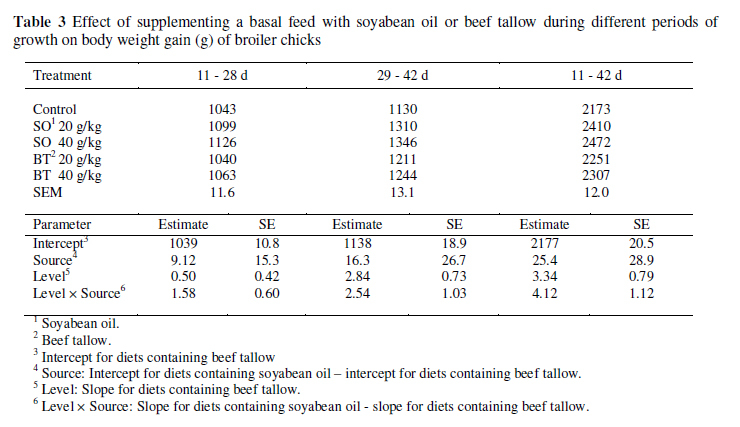 (2005), who studied the effect of different levels of soyabean oil (0, 2.5, 5, and 7.5%) on performance, observed that feed intake to 39 d in chicks fed a diet containing 2.5% soyabean oil was higher than when a diet without soyabean oil was fed, and they commented that this may have been the result of better palatability of a fat-supplemented diet. In contrast, Sanz et al. (2000) evaluated the effect of diets containing sunflower oil and a mixture of bovine tallow/swine fat in broilers and did not observe any effect of the lipid sources on feed intake. Also, Sadeghi & Tabiedian (2005) reported that the inclusion of different levels of tallow (0, 2.5, 5, and 7.5%) had no significant effect on feed intake in 7 to 21-d old chicks. These results are in disagreement with studies that showed a decrease in feed intakes when UFA were fed (Sklan & Ayal, 1989; Huang et al., 1990). These latter authors believe that the lower feed intakes observed when diets containing UFA are fed may be related to the higher digestibility and metabolizable energy of UFA and thus reducing the energy requirement of the birds. One of the difficulties of making such comparisons is that different methods of statistical analysis have been used in these trials, with the majority not comparing trends but determining whether means differ significantly one from the other. Comparisons of trends are more fruitful in this context (Morris, 1983). The higher body weight gains with increasing oil inclusion may be related to better digestibility of energy in soyabean oil. Nitsan et al. (1997) showed that addition of 30 g soyabean oil/kg feed improved body weight gain in broilers compared with a feed containing no oil. Balvi & Cu kun (2000) reported that the average body weight gain of chickens consuming a feed containing corn oil was higher than among those fed soyabean oil or beef tallow. Similarly, Mehmet et al. 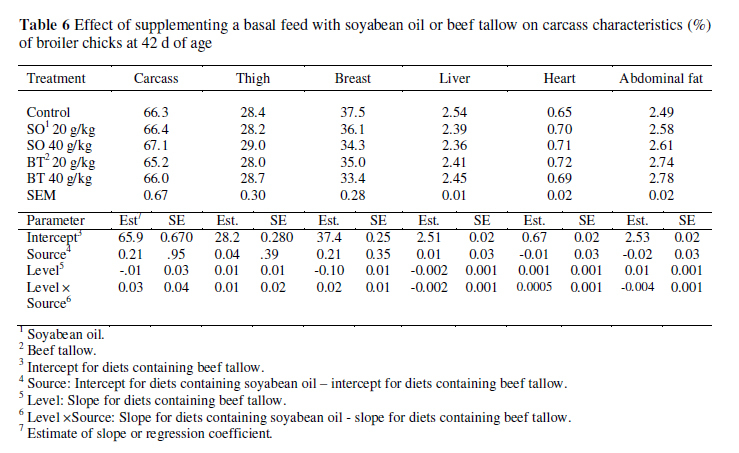 (2005) found differences in body weight gain between chickens fed 6% soyabean oil, poultry grease and beef tallow at 21 and 41 d of age. Feed conversion ratio (FCR) decreased as the content of both fat sources was increased, but not in the first period. Pinchasov & Nir (1992), Peebles et al. (1997) and Tabeidian et al. (2005) reported that FCR improved when chicks were fed diets containing PUFA. In contrast, Al-Athari & Watkins (1988) found no difference in FCR of broilers fed diets containing 5% added saturated fat or soyabean oil. In spite of all diets in the present study being isoenergetic, performance improved with supplemental fat inclusion which could be attributed to palatability and to a higher efficiency of energy utilisation (Palmquist, 2002; Baião & Lara, 2005). In this experiment the response in cholesterol and GLU concentrations differed significantly between fat sources with serum cholesterol concentration increasing and serum GLU decreasing at a faster rate when beef tallow was added than with soyabean oil. In other studies, broilers fed diets rich in cholesterol or SFA had higher carcass and blood cholesterol levels (Blanch et al., 1995; Verma et al., 1995). However, results of some studies do not agree with the findings of present study. For example, Fan et al. (1995) found that serum cholesterol concentration of chicks was not affected by different fat sources. Effects of dietary lipids on lipoprotein metabolism and some blood parameters have been extensively reviewed. Generally, SFA increases serum LDL value while dietary PUFA decrease serum VLDL, LDL and cholesterol and increase HDL values in comparison with SFA (Grundy, 1989; Kinsella, 1990). Soyabean oil would increase digestion and absorption and the biosynthesis of triglycerides in liver because of its unsaturated fatty acid content, thereby increasing the free fatty acid content in blood serum (Lambourt & Jacquemin, 1979; Aghdam Shahriar et al., 2007). Crespo & Esteve-Garcia (2001) reported that neither dietary lipid source nor inclusion level (60 and 100 g/kg) had an effect on dressing percentage, thigh or breast weights of broiler chicks. Similarly, Tabiedian et al. (2005) showed that different levels of soyabean oil and protein had no effect on carcass, pancreas or intestinal weight. From the results of the present study, it seems that abdominal fat percentage increases with oil or fat inclusion but that the rate was lower when soyabean oil was used. Similar findings have been reported for the comparison of abdominal fat deposition in birds fed with diets containing UFA or SFA (Sanz et al., 1999). In addition, Sanz et al. (2000) demonstrated lower total body fat in chicks fed diets containing UFA in comparison with groups fed SFA-enriched diets. Various studies have demonstrated that replacement of dietary SFA with PUFA reduces the amount of abdominal fat in broiler chickens (Pinchasov & Nir, 1992; Zollitsch et al., 1997; Wongsuthavas et al., 2007). Zollitsch et al. (1997) reported that an increased fat content of the diets, especially SFA (tallow and lard), produced higher abdominal fat deposits in birds since energy originating from SFA is more easily deposited in the fat pad and/or around the internal organs, than that from UFA which is metabolically used. Crespo & Esteve-Garcia (2001) suggested that energy retention increases with the feeding of SFA, while energy expenditure should increase when PUFA are fed to birds. The metabolic basis for the diminishing effect of PUFA on abdominal fat is poorly understood (Sanz et al., 2000; Villaverde et al., 2006). One possible mechanism could be that PUFA are preferentially oxidized and thereby yield ATP so that carbohydrates are shifted from the oxidative to the lipogenic pathway. The conversion of glucose to triglycerides is less efficient in energy deposition than conversion of fatty acids to triglycerides (Wongsuthavas et al., 2007). As a consequence, the feeding of PUFA instead of SFA would lead to less deposition of abdominal fat. Another mechanism is inhibition of de novo fatty acid synthesis by higher intakes of PUFA, responsible for the reduction of abdominal fat in the chicks fed diets containing soyabean oil (Ide et al., 1996; Zhang et al., 2006). Yeh & Leveille (1971) fed large amounts of vegetable fat to chickens and noted a decrease in quantity of free coenzyme-A available to support de novo lipogenesis. It was generally thought that the inhibition of lipogenesis by dietary fat involved the flux rate of fatty acyle coenzyme-A or availability of lipid precursors in the form of dietary carbohydrate (Roseberg et al., 1999). 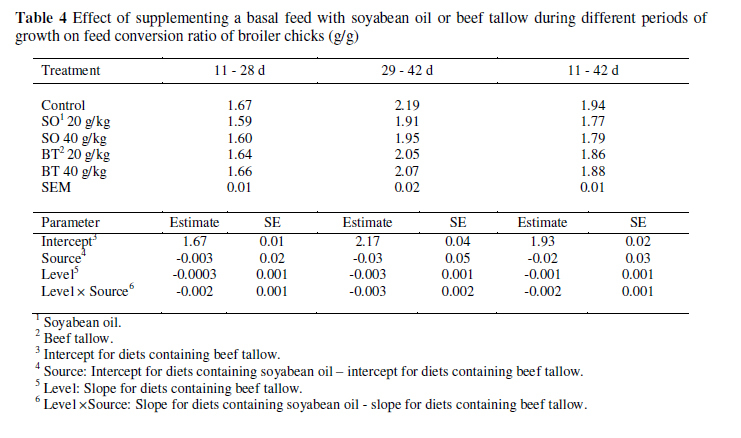 Supplementation of broiler diets with low levels (up to 40 g/kg) of soyabean oil in low energy diets improves performance and reduces abdominal fat, serum cholesterol and LDL content in comparison with chicks receiving diets supplemented to the same extent with beef tallow.